Pogo Stick has a modern design adaptation of the classic toy. 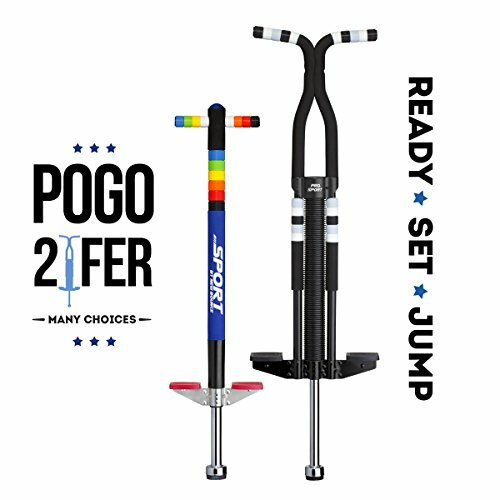 Healthy and exciting fun for boys and girls of all ages as Sport Pogo Stick recommended for jumpers ages 5 years and older whereas pro Sport Pogo Stick recommended for ages 9 years and older. It is perfect for the beginner and for intermediate riders. to help you stay in control. As a safety precaution, it is recommended to always use a helmet. Your back is the cornerstone of pogo stick movements. your back gets a strong workout, and every motion you make on the pogo stick requires your back to help stabilize you. Aside from occasional sit-ups and pushups, however, core exercises are often neglected. Core exercises are an important part of a well-rounded fitness program. with your back to help stabilize you as you bounce. You can work your stomach muscles even more by tensing your abs as you jump up and down. ►To prevent Head Injuries, we recommend that you always use a Helmet. ►For the safety of you or your children, please use it on flat ground. Do not use it on a slope or uneven floor. ► Children must be supervised / guided by their parents while using. We dedicate to provide Amazon customers with excellent service and good quality products. Being an authorized seller with thousands of satisfied customers, we are here to serve you. We appreciate your business. ► Sport Pogo Stick is meant for ages 5 to 9, and is able to handle weights from 40-80 pounds. ► SOFT, EASY GRIP FOAM HANDLES- The handles on the Pogo Stick features a nice padded hand grip. Makes it easy to hold on when you're flying high!